Another gorgeous spring day here in El Paso. I have been finding every excuse to spend time outside. My excuse today is a Casa Cuba by A. Fuente. The Good Stuff: The Casa Cuba is one of the first new cigar brands that we have seen from the Fuente Family in a very long time. Made at the Tabacelera A. Fuente y cia. 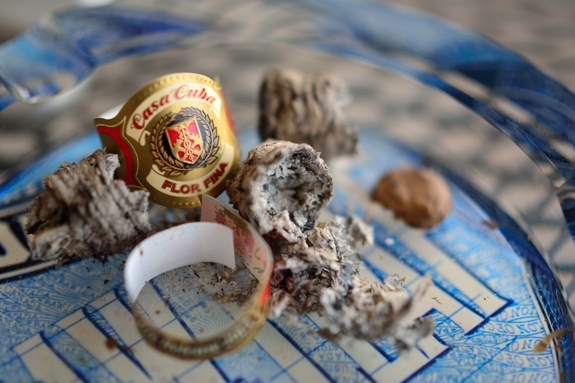 Factory in the Dominican Republic the Casa Cuba is a homage to the blending tradition that Fuente Sr, who blended the Casa Cuba, had carried with him since he was a child. 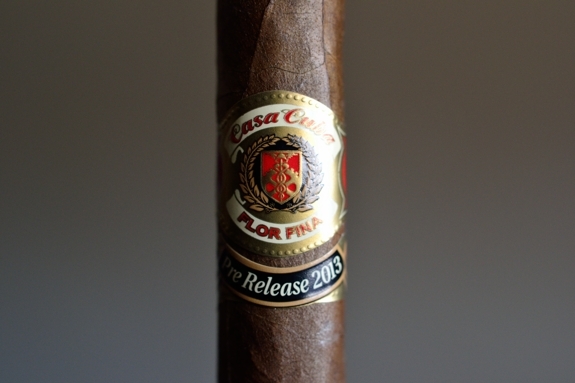 The Casa Cuba was set to be released almost a year ago, but just started hitting shelves of specific retailers during the final quarter of 2013. I got mine from the great team over at Bonita Smoke Shop. The blend starts off with a Ecuadorian Havana wrapper laid around a Dominican Binder, filled with a mix of Cuban-seed Dominican Fillers. The Casa Cuba comes in 4 sizes each named after Cuban Dominoes: the Doble Tres (5.5 x 44), the Doble Cuatro (4.5 x54) the Doble Cinco (5 x 50) and the Doble Seis (6 x 52) and will range between $8.75 and $10 a stick. 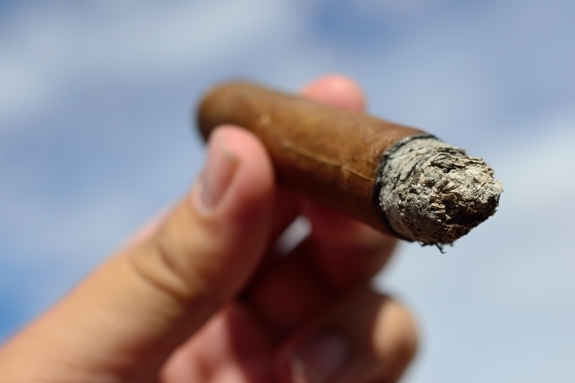 Each size is made by a single cigar roller inside Fuente’s factory in the Dominican Republic. 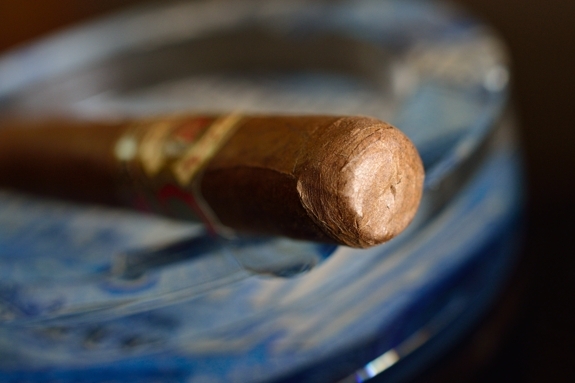 Prelight: The Casa Cuba is not only blended in an old style, but the cigar is designed to look and feel like an vintage cigar. This starts with the simple, muted band. The band is real simple with black, gold, beige and red ink with a simple crest on the front and the words “Casa Cuba – Flor Fina” printed around it. I was surprised not to find any Fuente markings along the band. Even the wrapper looks like a rustic tobacco with lots of dark brow webbing and veins running through the medium brown body. 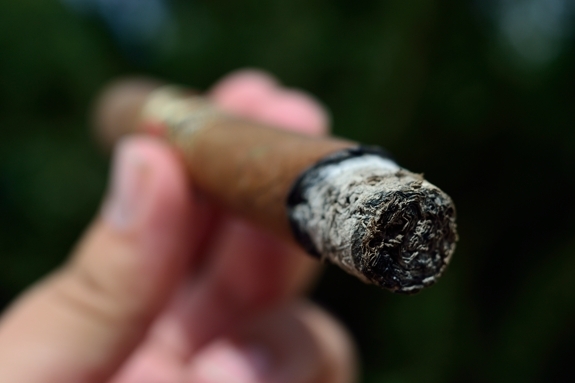 The body on the Casa Cuba is relatively spongy with a few harder spots throughout the cigar. The wrapper is pretty dense and feels as if it wouldn’t be torn very easily. The cap is finished off with a pretty sloppy double cap. I’m not sure if the caps on these cigars are purposely made to look sloppy or if they are actually poorly done, but I can say that I haven’t had an issue with cutting, or peeling on the cap so I’d vote for the purpose. Not only that, but Fuente seldom skimps out in terms of construction. 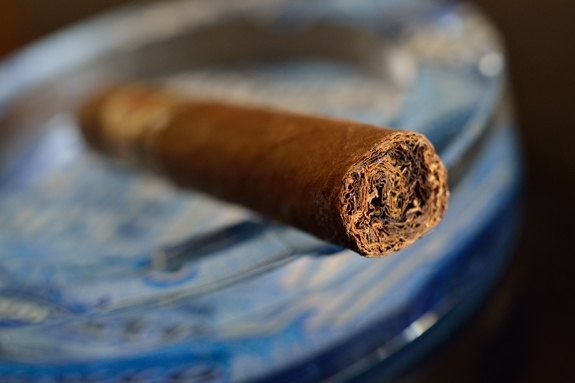 The wrapper on the Casa Cuba gives off a very strong woodsy, cedaresque aroma while the foot only gives off a mild tobacco scent. The cap cut clean and easily using my Palio double bladed cutter. The cold draw produces a pretty mild set of cedar, honey, and spice. I really had to reach for those flavors too. First Smoke: The Casa Cuba started out with a bit of unexpected black pepper. I didn’t pull any from the prelight or cold draw. After the first few puffs the pepper quickly faded away and I was left with a very woodsy, creamy, tobacco filled flavor profile. Not much in the flavor department, lets hope that changes as the cigar progresses. The draw is slightly tight but after a puff or two I get the draw I’m looking for. The burnline is razor sharp and has a few very minor waves. The ash is very tightly compacted and bright white and held on for an inch before falling into my ashtray. Halfway There: Halfway through the Casa Cuba and the flavors haven’t really impressed me. 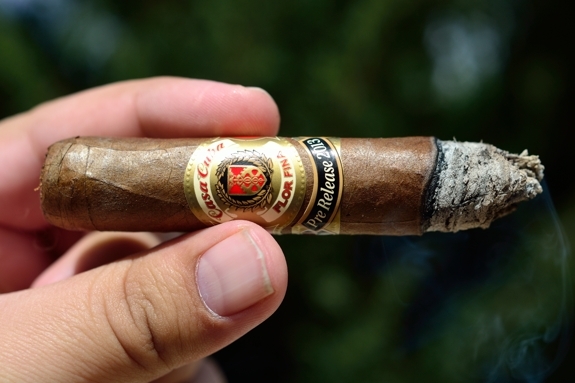 The cigar is very smooth and creamy so it has that going for it, but the lack of dimension and bolder flavors may just cripple this experience. The main flavors are still cedar, tobacco, and now a bit of spice has crept in. The retrohale is nothing to write home about either coating my nasal passage with nothing more than cedar. The burnline is still a bit wavy but very sharp while I am feeling absolutely nothing in the nicotine department. Finish: Astonishingly enough there was a brief ramp up in flavor into the final third of this Casa Cuba, but not enough to overcome the first two legs of the experience. The main flavors are still tobacco, cedar and spice but the spice has really taken off in the final third. I really wish there was a bit more thrown in, maybe some sweetness or coffee flavors would do wonders for this smoke. All in all it took me about and hour and a half to take this cigar down. The burnline was great the entire time and never required any additional action from my torch. I felt absolutely nothing in terms of nicotine, nor were there any harshness even into the final inch. Overview: Overall, I wasn’t very impressed with the Casa Cuba. Especially coming from A. Fuente. The flavors just seemed muted. The experience boring, and the lack of depth and dimension really put a damper on things. On the bright side, the cigar burned like a champ and was probably one of the creamiest cigar I have ever smoked but that could have been due to the lack of any real dominant flavors. With the higher price tag I would have to pass on recommending this cigar or picking up any more of them. I mean, it is what it is, an old school mild cigar but you can’t throw this out in today’s market with a new school price tag and expect people to fall in love with it. Pairing: I knew the Casa Cuba was lacking in the flavor department so I decided to pair this cigar with a beer that I had hoped would help bring the body up without overpowering it. 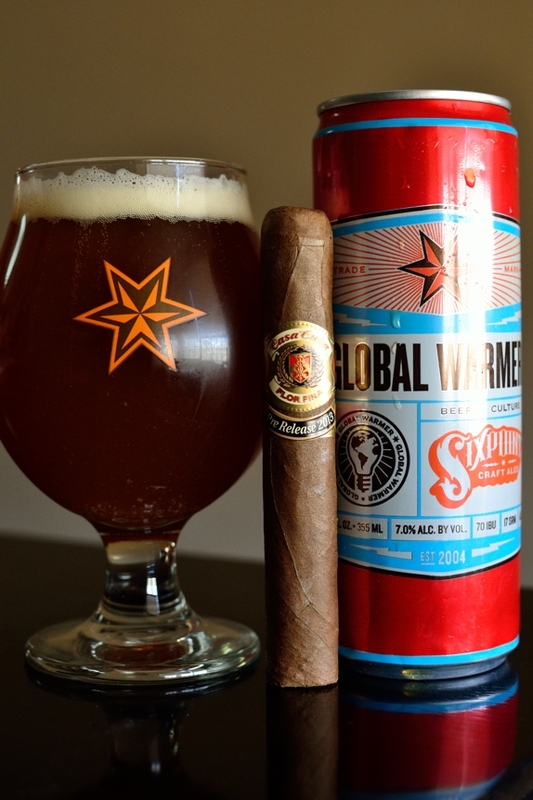 Sixpoint’s Global Warmer is a seasonal Imperial Red Ale brewed at the Sixpoint Brewery in New York. Coming in at 7.0% ABV this bad boy packs some great fruity, caramel, and spice flavors with a nice hoppiness on the finish. Interesting enough it actually did add a lot to the cigar experience by filling in some of the flavor gaps, but a beer can’t work miracles. I am but a simple man, try it out dude. I could be totally wrong. And if you do, I’d love to hear your thoughts. Daaaaaaaaamn!!!! That is one excellent cigar. Just bought one from Neptune Cigar in Miami, FL. to see what Fuente’s newest creation was all about. The owner was thrilled that I was going to give one a try. He told me if ever I have smoke a Cuban Cigar before…this is as close as it gets. I was thoroughly impressed. I found your critic spot on, dude!!! My only problem is the price point. Neptune was selling these for $337 for a box of 30. I’m not a rich man but do luvs me a good cigar. I need to find $337. 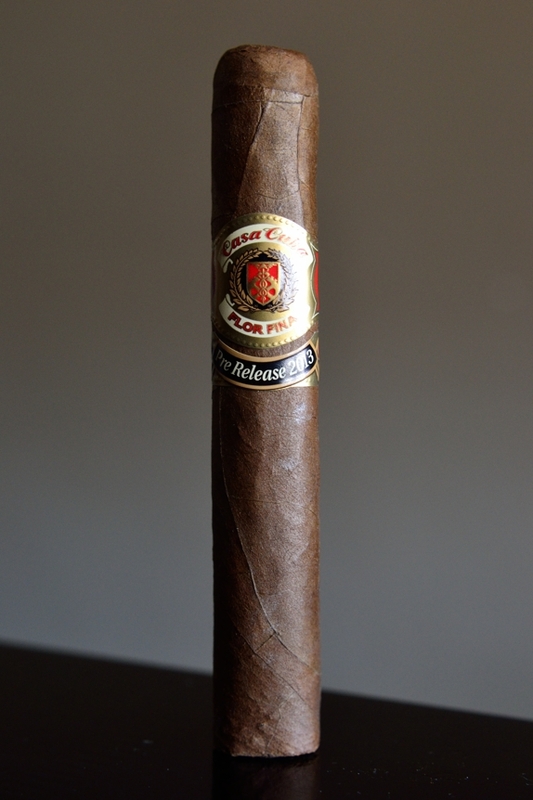 Great review, when it’s lacking flavor have you ever not finished the cigar and still went on with the review ? No sir. No matter how bad it is. The only time I’d contemplate putting a cigar down prematurely is if the cigar is un-smokable due to draw/construction issues. Never flavor. Since flavor is so subjective it would be wrong for me not to report my findings just cause it didn’t appeal to my palette. If you check out other reviews for this stick some liked it quite a lot. Nine bucks for a mild stick that doesn’t show up until the final third? No thanks.on the cigar, but thanks as always for the honest take. Does the “Pre Release” secondary band have any significance? Damn, I hope Sixpoint distribution reaches here soon. Strange, I know, but the ones with the prerelease bands are actually the latest samples believe it or not. I really enjoyed the review, though based off my palate, I’ll disagree with Tony. If you name something “divine inspiration,” it should probably taste like the Joya de Nicaragua Antano Dark Corojo, or anything other than THIS. This was a real disappointment. I wish I had read your review before wasting my time. While it’s pleasant aroma is a borderline redeeming (or at least mitigating) factor, Jesus himself couldn’t save this cigar. I’d imagine many farts are more complex and potentially tasty than this travesty of humanity, and utter waste of tobacco. May God have mercy on this soulless garbage. Hey man love your reviews i am from el paso i am now in san antonio but i visit a couple times a year i have yet to find a sweet place to skokeany ideas? Nice man! Thanks for stopping by and reading! Vitola’s downtown is pretty awesome. Great staff, good selection, lots of whiskey and craft beer, plus its a full lounge so smoking is permitted! Why even waste your time reviewing this with a beer of all things. Properly assessed would have been some Dominican rum or even a single malt. I have that Resin glass by the way. Cool.